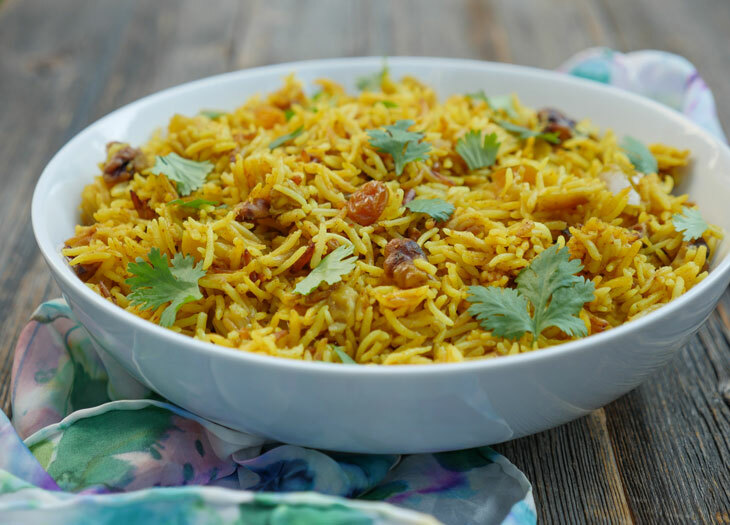 This curried apple pilaf is a flavorful side dish that’s both sweet and savory. It’s made with basmati rice, sweet apples, toasty walnuts and plump raisins. Pair this side with any protein for a perfectly flavorful meal. Before I get to the recipe – I have to share some exciting news!! 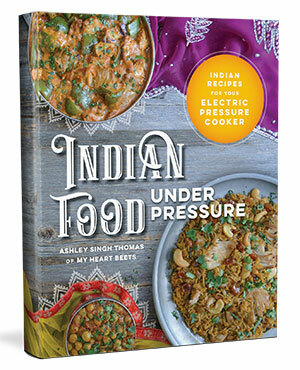 My new Indian Instant Pot Cookbook is now available!! 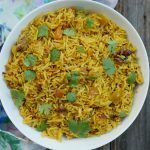 You can make this curried apple pilaf in less than thirty minutes by using an Instant Pot (this is the model that I have and love)! It’s the perfect side to pair with roast chicken, broiled lamb chops, rib roast – you name it. 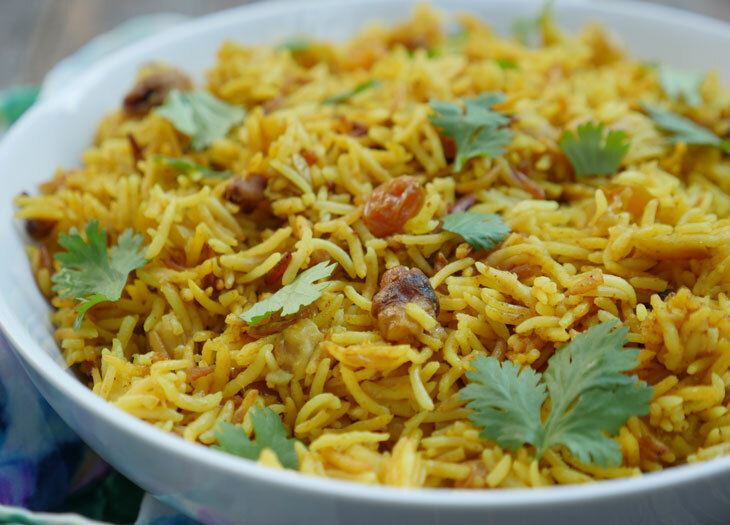 Anything that goes well with plain rice will go well with this curried rice. The soft apples add sweetness, the toasty walnuts add a bit of crunch and the curry powder lends a savory flavor to the dish. I also added some apple juice to the rice to give it extra apple flavor. And I used my all-time favorite type of rice: basmati rice – this brand is my favorite! This is an Indian-inspired recipe – not authentic one by any means. In fact, I consider this more of a western dish than I do Indian. That’s because this recipe calls for curry powder, a spice blend that is actually a British invention. If you’re not familiar with curry powder, you can read this blog post that I wrote about it. While I do post a lot of authentic Indian recipes, the truth is that I like the flavor of this Indian-inspired spice blend because it’s convenient and easier than grabbing several jars of spices. This is crucial when living a busy lifestyle (or in my case a busy “chasing a baby all around the house” lifestyle). I made this dish for a food blogger potluck that we had in my backyard this past weekend (see my Instagram post about the dinner!). Once I and the other bloggers get all of our apple-themed recipes up I’ll be sure to post a recap of the event here on the blog. 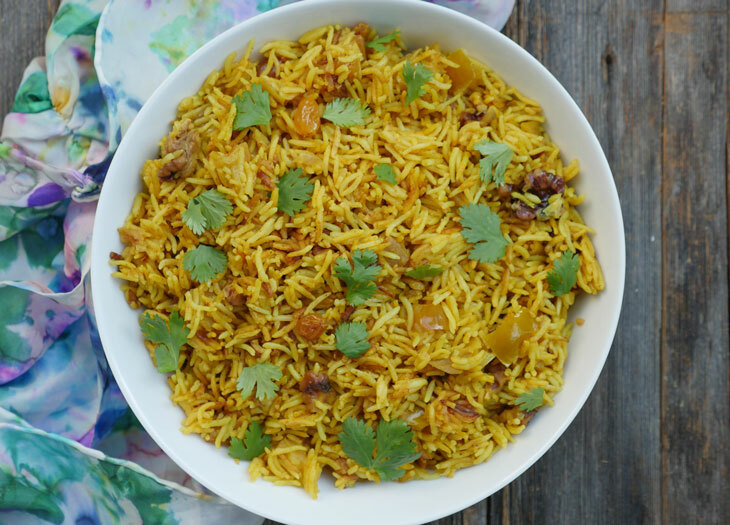 It was so much fun and the food was all really good – so stay tuned for that 🙂 In the meantime, make this curried apple pilaf and tell me what you think about it! Soak the basmati rice in cold water for 15-30 minutes. Drain and rinse. Press saute, add butter and once it melts, add the whole spices to the pot. When they begin to sizzle add the onion and stir-fry for 6-7 minutes or until it begins to brown. Add the walnuts and raisins, stir for 1-2 minutes to toast the walnuts, then add the remaining ingredients and mix well. Cook for 6 minutes at high pressure. When it is done, wait 10 minutes then release any remaining pressure. Hi Ashley! This recipe is such a slam-dunk hit! 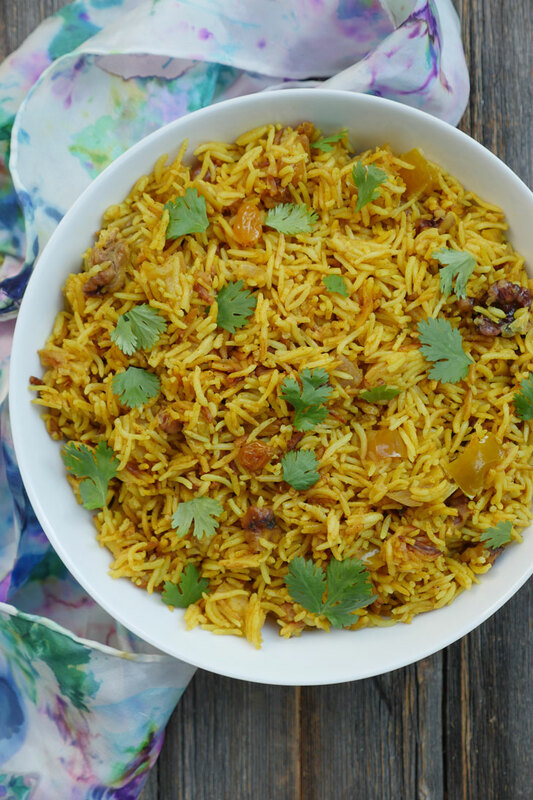 My husband and I loved the sweetness of the apple with the spices and masala in the rice. I shared the recipe with my mother, who went absolutely BANANAS about it! Loved it!